Turning into our neighborhood late one night, a splayed-out woman lay on the side of the street. She looked like a snow angel waiting to be run over. My husband flipped a U. I cautiously approached her, wondering if she was alive. After gentle rousing, it was clear as vodka that she was waaaaay drunk. As in: blotto, smashed, intoxicated, zonked, inebriated, totally wasted … whatever you call it, this woman wobbled as I helped pull her up to stand. She held a bag of leftover Chinese food and garbled out her name. After a short-jumbled discussion, I could tell she needed help (in so many ways). She was not a threat and uninjured, so I placed her in our front seat and hopped in the backseat with my sons whose eyes were big as saucers as we drove the drunk-street lady home to the other side of our neighborhood. I prayed she would not barf. She mumbled how she had lost her job, was in a bad place, and so sorry and blah, blah, blah. I was just thankful no body ran offer her passed-out self. When we got her home, I watched her sway like Kumbaya Singers on her porch as she apologized and thanked me. Growing frustrated watching her fail to fit her key into the keyhole, I did it for her. I helped her into the house, placed the Chinese leftovers in this complete stranger’s refrigerator and shlepped back to my family waiting stone sober in the drive way. Her son had since drove home and was thanking my husband for helping out his mom. That is my “Pay it forward” moment and although risky, I don’t regret it. 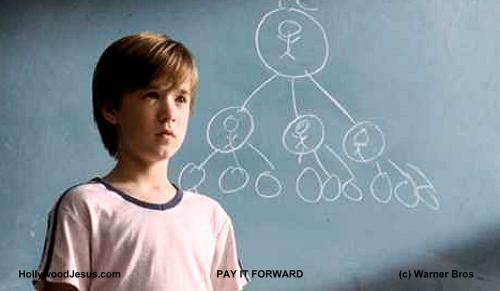 When you "Pay it forward", according to the movie, you do it in “threes” and then those folks "Pay it back" by helping three strangers. The truth? Folks have graciously stepped into my life and unconditionally helped me when I couldn’t help myself and I am sure I’ll need more unsolicited assistance down the road. Apparently, generosity is contagious, so "Pay It Forward."